I am currently running a Giveaway promo and encourage all to apply! I am 7 facebook LIKES from 300 and my blog is hovering around 50 followers (of which there is a small percentage of loyal readers and I THANK YOU for that!). I am kind of sad that social media folks are quick for the hearts but not quick to follow along. I do not pay for followers or any of the other gimmicks that go along with that so my small crew is here because they want to be. THAT SAID, I am curious if I can snag a few more by offering a bribe of sorts! I have a set of 4 Indian Kantha placemats that I would like to give away. I sold out of the others and these were in my booth for a while. They have a $30 retail value for the set. I would love to send them to someone to enjoy! Here is how it works. Please sign up to follow my blog via my mailchimp which is the annoying pop up that comes up when you head to madmodworldvintage.com , which is my mailing list. Then head to my facebook page at facebook.com/madformodmalissa and click LIKE. 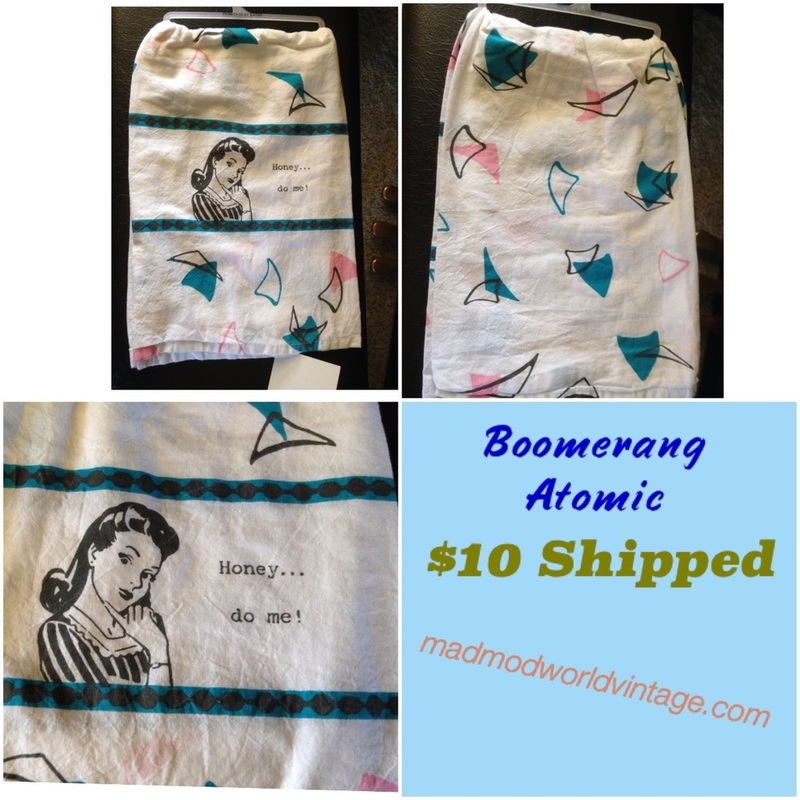 Then send me an email malissa@madmodworldvintage.com so I add you to the drawing. I am thinking that I will probably offer consolation prizes as well depending on the level of participation. If you already follow both, please just send the email and you are in! I know not everyone sees all Facebook posts so that is why I am hoping to get some more loyal blog readers because that is the best way to get all my info out. DEADLINE TO ENTER IS THANKSGIVING! I will draw the winner in the evening. Please invite your MCM loving friends! Booth 2R09 at Fleetwood Antique Mall, 14129 Fleetwood PA 19522 WED-SUN 10-6 OFFERING 20% INVENTORY for CASH SALES except anything marked FIRM THROUGH the month of NOVEMBER. The only item I have currently marked FIRM is my Herman Miller rocking chair. I plan on changing out some more items so please stop by if you have not checked it out in a while. I have selected many lower price point gifts and items to feature so if you are in need of something for your holiday gift giving, don't forget to SHOP SMALL! ETSY SHOP Gift with purchase Black Friday through the holidays while supplies last! I will throw a little special something in every box this holiday season! I do have a coupon code active right now through midnight Thanksgiving night....15% off shopwide code PYREXSWAP. Please feel free to use it to get a jump start on your holiday shopping! 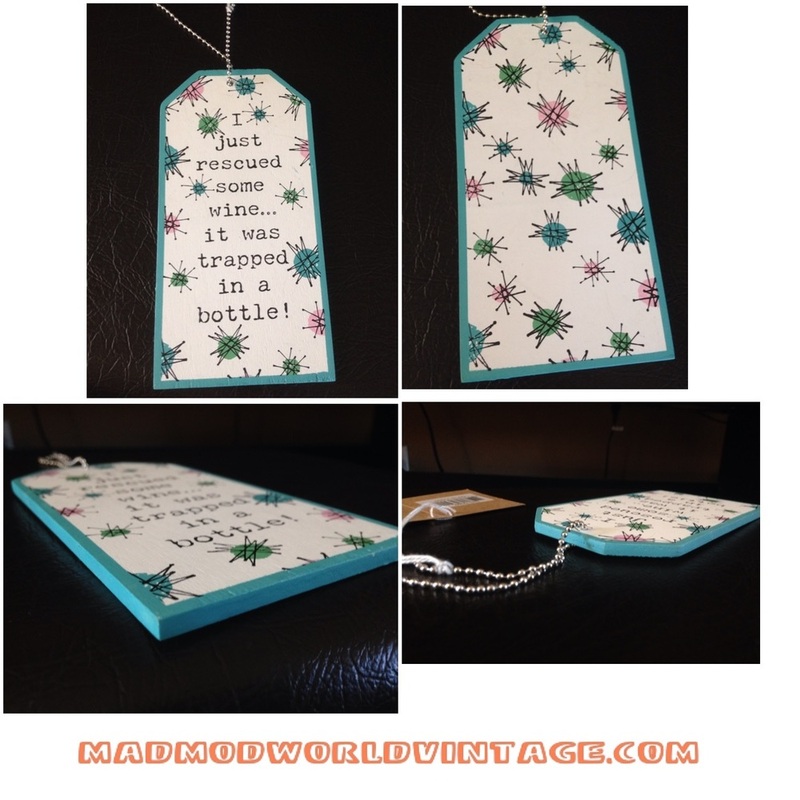 Please do not use it on any furnishings I have listed ON SALE, but anything else goes. This is a special thank you for being my loyal followers! Use the code at checkout and I will enclose the special gift for you early! EBAY SHOP I am currently featuring 3" and under HEN ON NESTS from our collection and a fabulous selection of pyrex! Please stop by and check it out. I also am able to offer CHOOSE YOUR BEST SHIPPING of the larger sets! That's right! I have been doing this long enough to know my way around getting the best shipping rates and so many sellers rip people off. You will be able to choose from USPS and FED EX at 35% off rack rate. Pick the best one for you! Please make sure you check them both! USPS will be cheaper for east coasters and mid westerners but south central and west coasters will need to use Fed Ex to get the best price. CHAIRISH I cross list my best furnishings on Chairish. Although I will bus ship almost anything to save you money, I will also say, there are a few things that I feel would be best sent fully insured with white glove and chairish definitely has better shipping rates negotiated than what I or you could get on our own. You can get an instant white glove quote on my chairish page! If you are interested in larger furniture items and need shipping cross country, reach out to me and we can definitely discuss the options. I want to save you money and if I can do that for you, I will! In most cases, I have not actually packed and quoted an item and will only do so once a serious shopper contacts me. I work to get you options fast! DELIVERIES I am generally available currently on Tuesdays, Wednesdays and Fridays to schedule meet ups and deliveries in the region. I will continue to try to get most items packed and out the door within 24 hours as is what I am accustomed to and what my returning customers expect. I will be working on the next Herman Miller rocking chair this week as the base and shock mount supplies are en route to me as I write! Expect it to be listed by the weekend if all goes well! I am also trying to get as much fresh inventory listed as I can and will be adding more to the booth space in Fleetwood! Holiday Updates plus coming attractions. Hope you all are gearing up for a great holiday! I am still working very hard to get some projects turned over and listed before the end of the year. I have lots of things in the queue for the winter months so keep an eye on the listings and instagram! At anytime, feel free to email me if you would like first dibs on something that I am working on! I would be overjoyed to have a serious buyer lined up before I am done and would gladly send you personal updates on the project. Also, please note that to avoid being stressed out before the holidays, if you require Greyhound shipping for your purchase, please allow 2 weeks. It generally takes about one week but I do not think either one of us want to stress out about a shipment that close to the holidays. If you are willing me meet me within an hour of 2 of where I live (eastern PA), I would gladly accommodate you right up until the holiday! I also would gladly add a card or make any special accommodation for you, please reach out! I am still feverishly trying to get all orders out the door in 24 hours or less, shipping quotes to you in about the same time. I am currently working on a set of 7 Lane Perception dining chairs in Walnut finish. They are very sturdy and have generous seats....good for those of us who are not petite! Quality American made mid century furniture is being sought after and Lane in particular has really spiked in popularity. I have just put all brand new black vinyl coverings on the seats and will be working on any structural tightening and finish issues next. I hope to have them ready to ship in the next week or 2. If you are in need of some walnut chairs, please give them some consideration. They have a great Danish style without the larger cost. This large of a set is definitely not an easy find without hunting and pecking it together. It was actually in the same family all of these years....with 11 children. That should tell you how well made it is! Here is a PEEK! Naked chair...down to the foam! 5 of the 7 looking great but hogging up my living room! NEW!!!!!!!!!!! 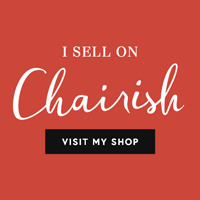 I am now on Chairish.com! I currently have 2 listings and neither are etsy appropriate. I may continue to list things over here but I am testing the waters for now. 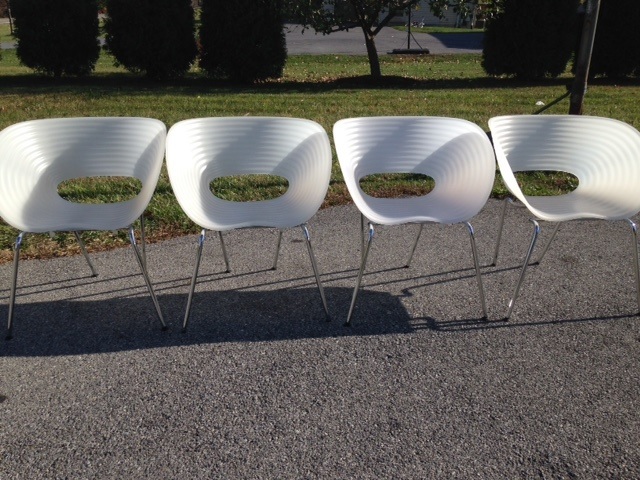 Just listed is a FABULOUS set of 4 Vitra Tom Vac chairs designed in 1999 by Ron Arad. He is a very influential designer and artist of our current time and these chairs are not only top of the line in construction, the design is totally rad and will be great with your MCM! They are also listed right here on this website at a reduced price, so please, now that you are in the know, shop direct for best price! I added a new page to the site, EXCLUSIVE ITEMS FOR SALE. Here you can purchase direct from me! The Tom Vac chairs are available here as well as the awesome Franciscan Starburst kitchen towels and pillows! All prices include your shipping. Please send friends! First to purchase through my web site will get a thank you gift as I have no idea what to expect and may have to work out some kinks! I will continue to offer things here that do not fit etsy's criteria but are things I feel fit well with my shop! Hope you enjoy! This will also eliminate me having to send out paypal invoices to handle these transactions like I have been. Sorry I am quite long winded in this update but things are really heating up around here and I plan to bring in the New Year with even higher sales goals than this year! I have already beat my sales goal for this year, which over tripled what I sold my first year out! Thank you so much to all of my customers for that and I hope to continue to source, restore and find homes for even more worthy mid century furnishings next year! Your support allows me to keep saving this stuff and that makes me very happy!!! !